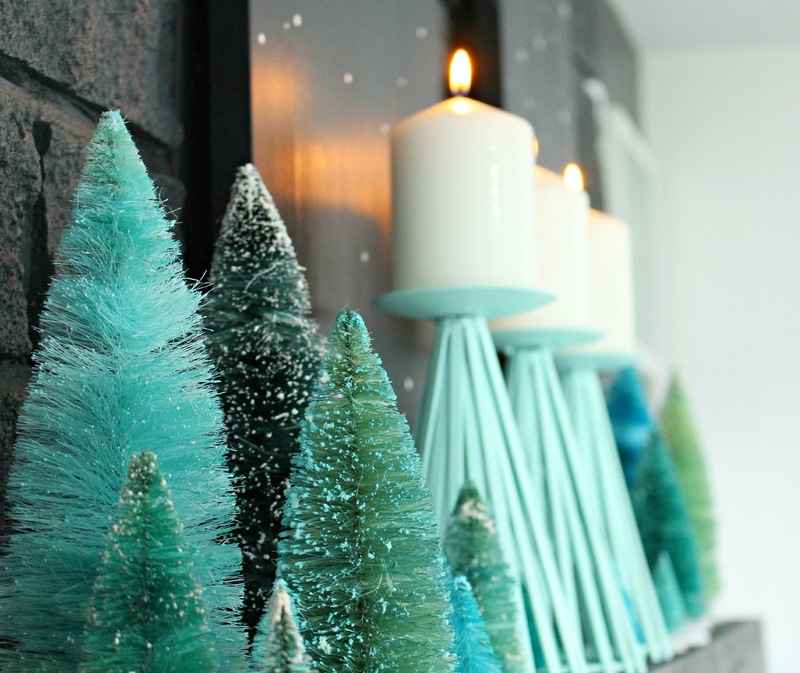 Styling a narrow mantle for the holidays is so tricky because there’s not a lot of space to create a fun, layered look but I’ve got a cute idea for anyone struggling with a tiny mantle – plus I’ve got a tutorial for how to dye bottle brush trees. My mantle is super narrow and has two unsightly vents that impede any efforts to make it look good, which is why I normally “style” it with a collection of rocks and call it a day! 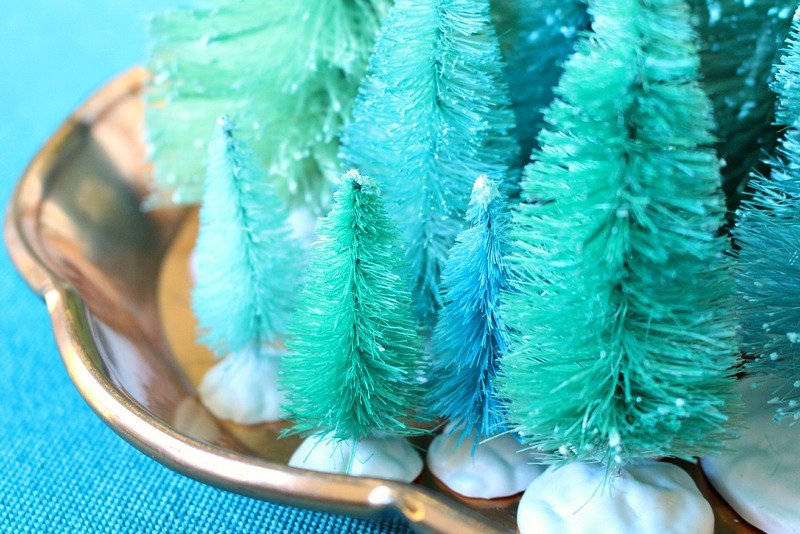 But I knew this would be a perfect excuse to go crazy with DIY dyed bottle brush trees, which are small enough to spruce up (see what I did there?) even the skimpiest mantle. I bleached and dyed most of the bottle brush trees various shades of mint and teal, but I left a few of the trees green. 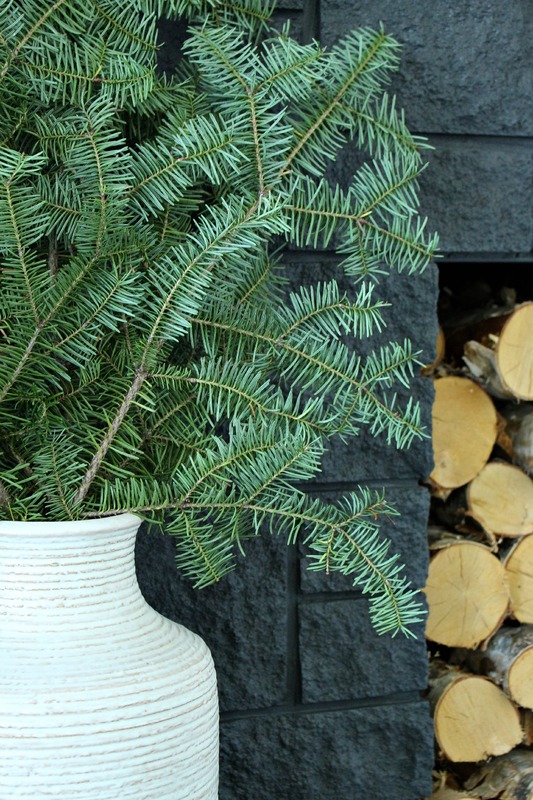 I also clipped some real evergreen branches and arranged them in my huge West German pottery floor vase on my hearth, which was a way to add something impactful even though my mantle is narrow. 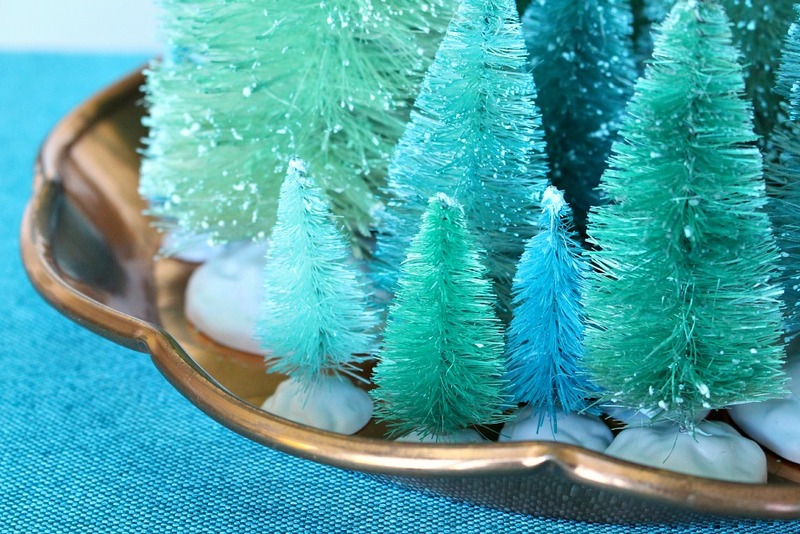 Obviously the cutest part of my holiday mantle decor is the bottle brush trees! 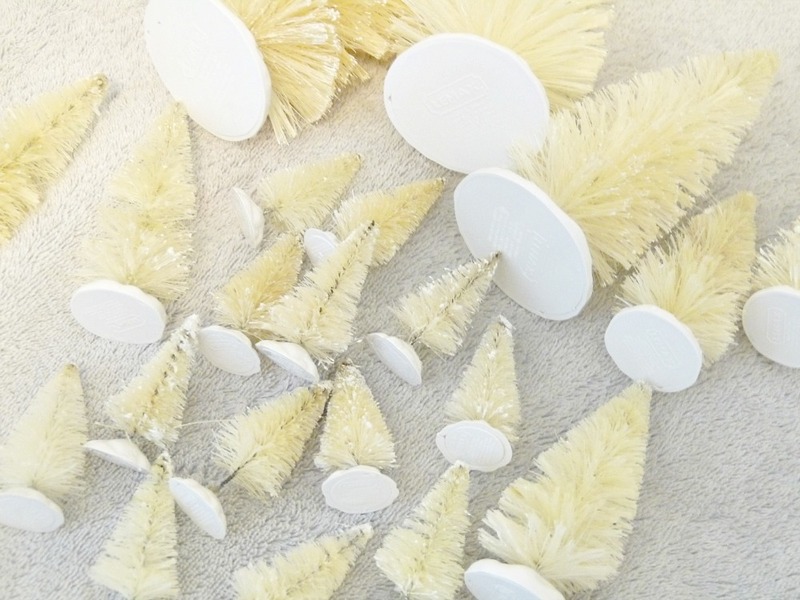 Keep reading for my tutorial for how to bleach and how to dye bottle brush trees. get the plain bottle brush trees – which is what I linked to. I have heard good things about the Tim Holz bottle brush trees, which already come bleached with a pretty wood base, but I liked having variety in the sizes. Once I was done fussing, I put on my rubber gloves and grubby clothes and poured some bleach into a small container and started dunking my trees in, one at a time, until all of the colour was removed. Eventually the bleach would get sludgey and murky, so I’d dump it and start fresh. Some people dilute the bleach, but full strength worked better for me. After bleaching, I gave each tree a rinse and set it aside. 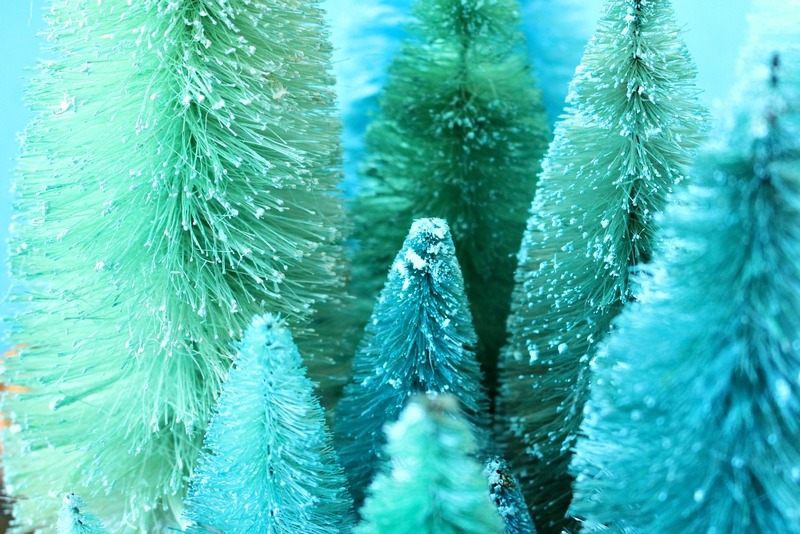 Now for the fun part: how to dye bottle brush trees! I mixed up two buckets of concentrated Rit dye, using only about half the water recommended by the manufacturer. I dunked a tree and set it aside to dry upright (with a towel to protect the surface from dye) – no rinsing required. Then I dunked another tree in the dye mix, but let it soak for a few minutes, then removed and let dry. I played around with each tree, letting each one absorb the dye for a different period of time. Sometimes I dunked a tree in both dye mixes. Near the end, I mixed the two dyes together and kept dunking trees. I only used two colours of dye, but ended up with a lot of variety with this method. I spent a couple of hours bleaching and dyeing these trees, and sequestered myself in the laundry room because it did make a bit of a mess. 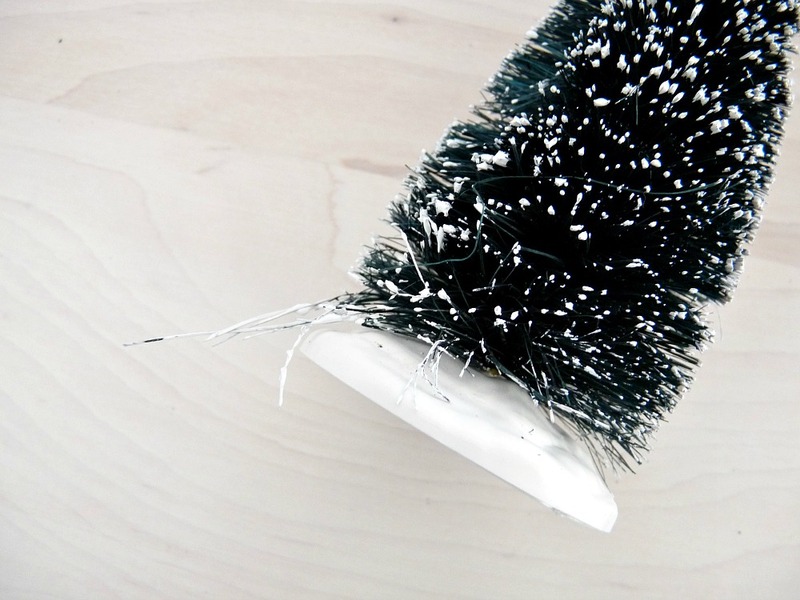 When all of the trees were dyed and dried (over night), I brushed them with a stiff bristle brush to restore any wonky branches to their proper shape. Unfortunately, some of the ones that arrived really smooshed never bounced back, but once they’re on the mantle in a grouping, they look fine. 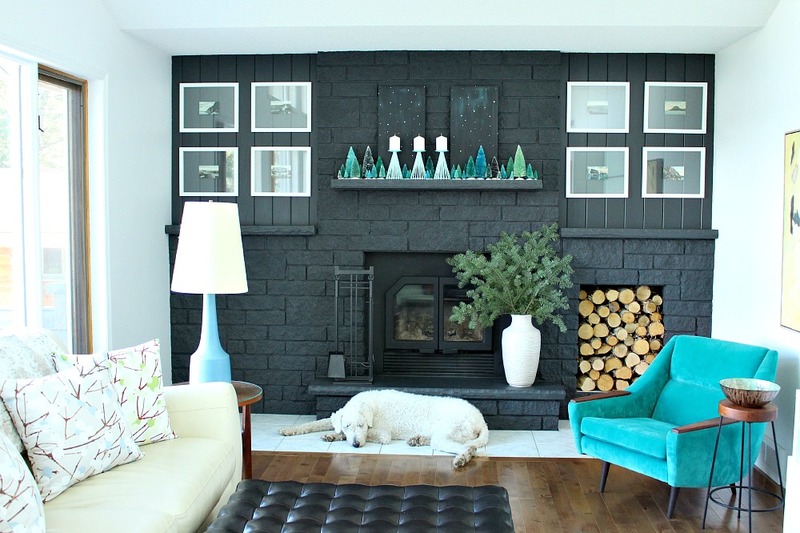 I love the vintage feel of the pastel hues – and how they really pop against my dark grey fireplace. The candle holders are a thrift store find, which I cleaned, lightly sanded and spray painted a cheery mint. 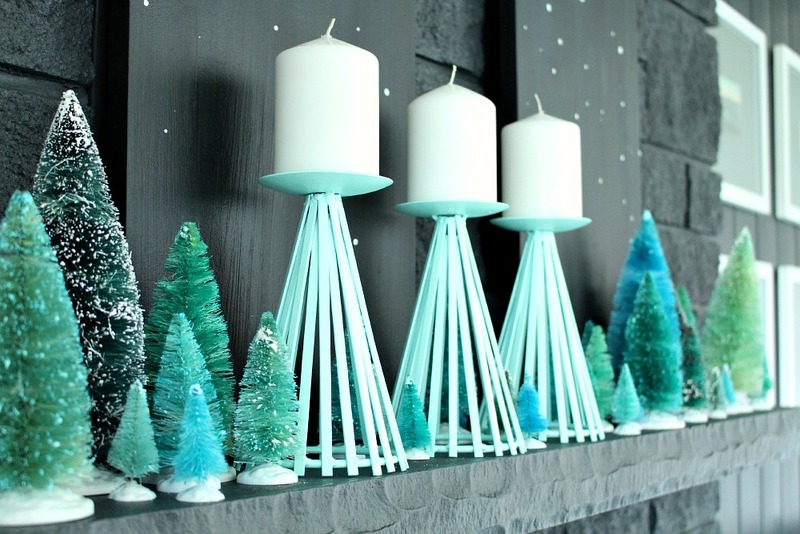 They have the same shape as the trees, so I thought they would be a perfect way to add some height and interest – plus the mantle looks so cozy when the candles are lit! 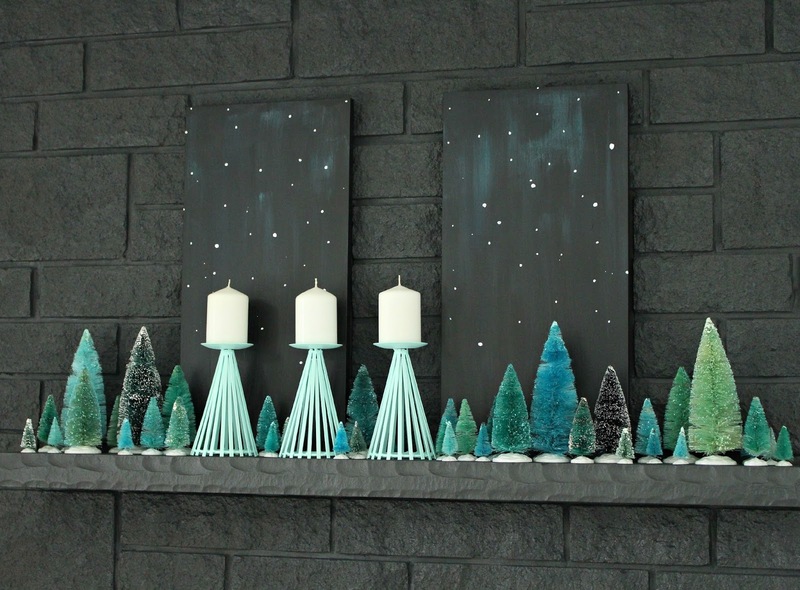 Behind the trees are two DIY painted “skies,” inspired by the moonlit look of my teal bottle brush trees. I grabbed two scraps of wood from my wood pile and painted them black and teal, to mimic the Northern Lights we see over the lake. I added specks of white acrylic paint to look like stars – or falling snow. 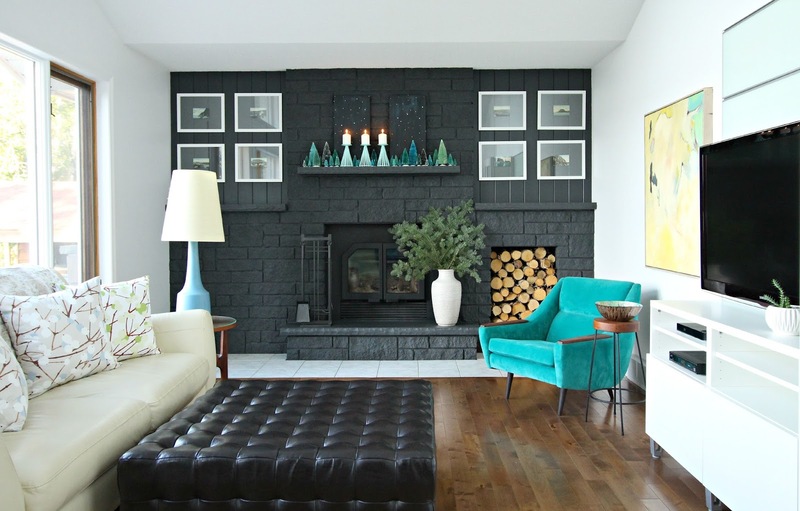 These paintings hide the vents successfully, but they also add some drama to my mantle decor. Last year my light up celebrate sign hid the vents, so this is clearly going to be an annual challenge! 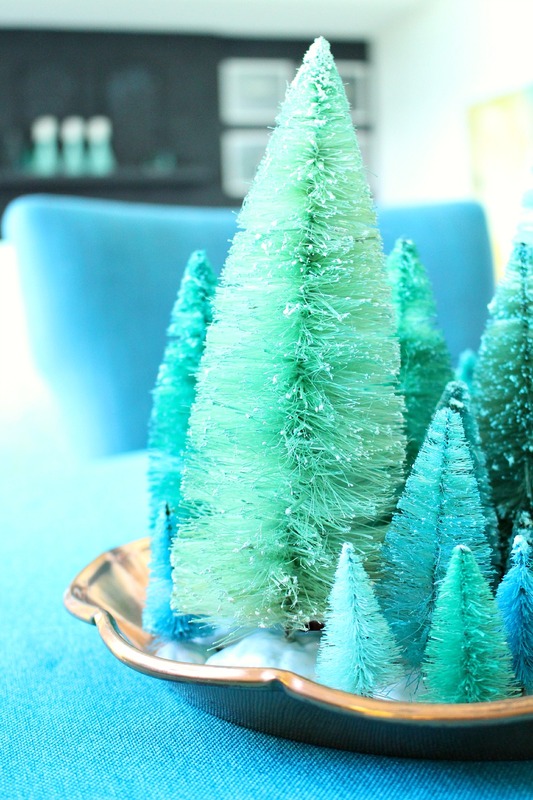 I love this holiday look for a narrow mantle and learning how to dye bottle brush trees was so fun and easy! 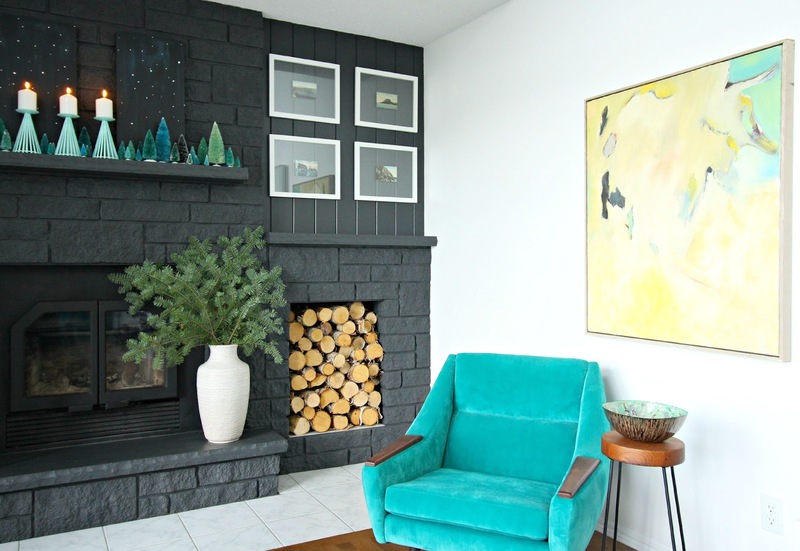 i have a bunch of vintage ones i had grand plans to bleach and dye in various shades like this on my black mantle as well…. well i went about bleaching only to find that because they were vintage and made differently…. they do not bleach. they came out maybe a tad cleaner. 😉 LOVE how this looks, tanya! Oh no!! That is good to know! I've never come across many vintage ones myself, and I wouldn't have guessed that they don't bleach. On the bright side, at least they didn't melt! They're beautiful, a bit of work though and I'm a lazy thing, you're not going to sell any in your Easy shop are you? I've been planning to do this for a long time. Thanks for the inspiration. Yours are nothing short of amazing! Such great colors. I think I may just bleach.. I love the creamy look. The creamy hue they turn is so pretty! If you're going to just bleach, I recommend diluting the bleach and soaking them a bit longer so the colour is removed evenly. The bleach didn't remove the colour uniformly each time but it didn't matter for me because I was dyeing them anyway. But if you don't want any splotchiness, keep them in a diluted bleach solution longer. 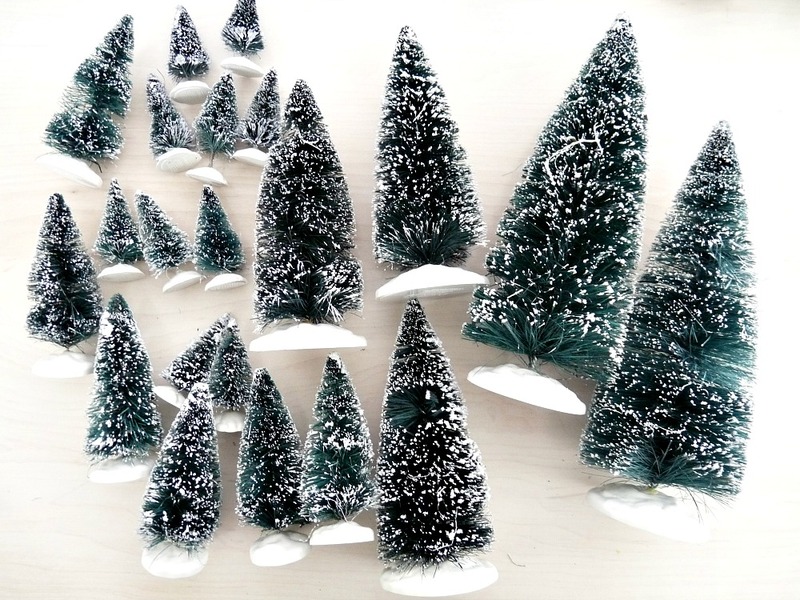 Or get the Tim Holz trees – they are bleached already! Looks good Tanya. I've been meaning to do this for a while and you've given me the push I need. It will add to my small collection of trees already to be put on the mantle. Thanks Ann! It's kind of addictive, you might find your tree collection doubling in size – although I know what you have are ones that are special and sentimental. Just beautiful Tanya! Lovely color choice for the trees. 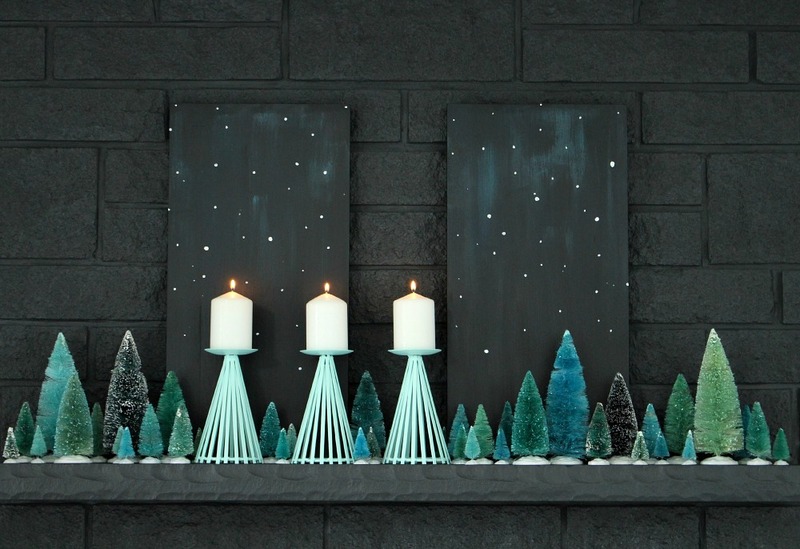 It blends in so well with your home, yet looks serene and Christmassy! Thanks!! I originally planned to add some pink, but in the end I couldn't do it! I just like aqua too much, lol. I like that the mantle styling doesn't compete or clash with my decor. Your DIY projects amaze me! How wonderfully beautiful – and very Canadian! Awww, thank you! Your comment made me smile 🙂 I love that you think it looks Canadian! I think that's the best compliment. These look so good in the colour tones you painted them, great job! Thanks!! It was fun seeing how many shades I could get with only two bottles of dye! I have done bleach projects with fabric and was told to dip the items in a vinegar and water solution after the bleach to stop the bleaching action. Don't know if this will help the longevity of the bottle brush trees, but it might be worth it to be on the safe side.Love your trees! That is a great tip! I will file that away because I've been interested in some bleach fabric projects. The trees didn't seem to get lighter after I rinsed them and they did hold the colour well – too well, because some ended up really dark so I had to rinse off some dye. But perhaps if I'd been going for a really bright red, I might have noticed that that residual bleach kept the colour from adhering or perhaps lightened the resultant hue? In any case, that's very good to know, so thanks for sharing! I'll let everyone know if I have any issues with fading or the dye rubbing off. WOW! 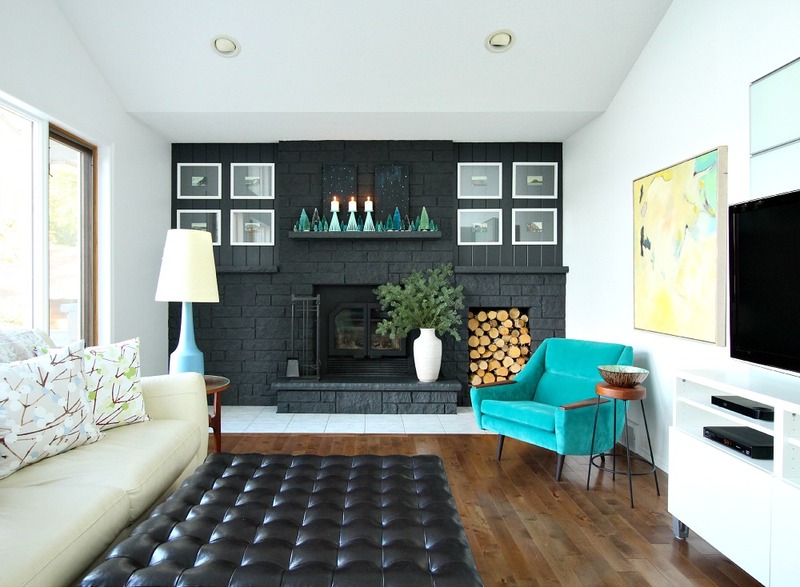 The contrast of the trees against your fireplace is phenomenal! Great idea, I love everything! Geez, my diy game is slipping, I didn't even know you could bleach and dye bottle brush trees. I'd been eyeing some in similar colours but they were from anthropologie and no longer available- this common refrain, "you could make these yourself", never once entered my mind. Also, the Anthro ones are sisal- I'd never heard of that, either. Yours are not only amazing but they look beautiful on your mantle. It's just the right amount and the perfect colour to contrast the dark stonework. Seriously LOVE it!! 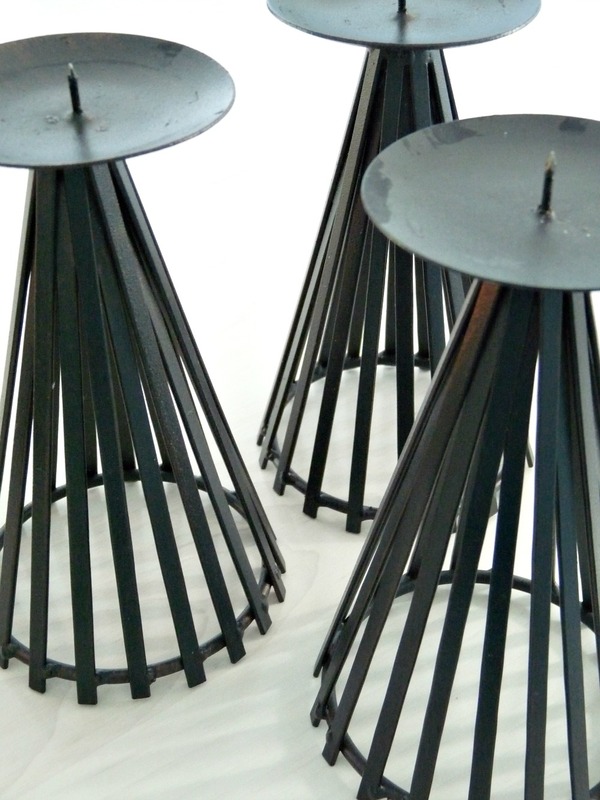 And the candlestick makeover- perfection,What a perfect display for your space. Sisal trees – interesting!! Wonder how hard it would be to make mini sisal trees from scratch? I think my DIY game has improved since getting a data plan and moving to the country because when Hubby drives us anywhere, I spend an entire hour trolling the internet on my phone, getting inspired, lol. We also have an hour to chat, so I bounce ideas around to no one in particular. I'm so happy you like my mantle styling! It's something I struggled with in the townhouse and haven't really tried to do much of it here. I'm motivated to keep experimenting, though! It makes the room feel festive and cozy, even with my cool colours. 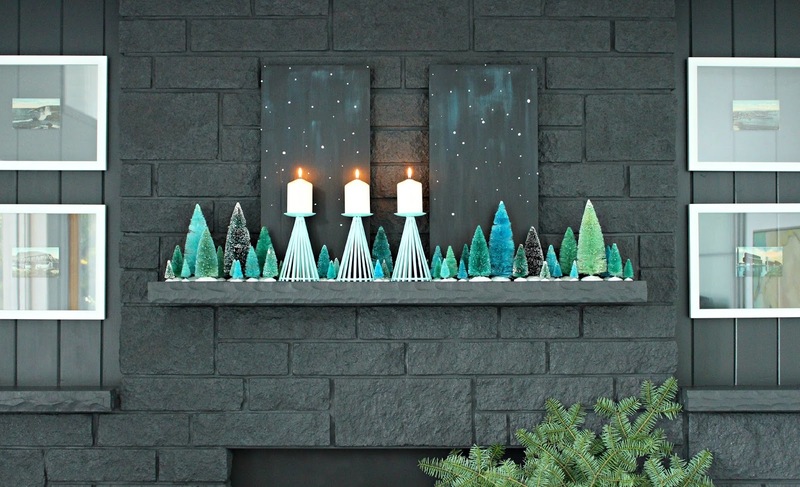 I'm trying to think of somewhere I can decorate like this seeing as I have no mantle and some of the Tim Holtz trees left over from something else. They look so damn cute! I have some ideas flagged – I should write a post! 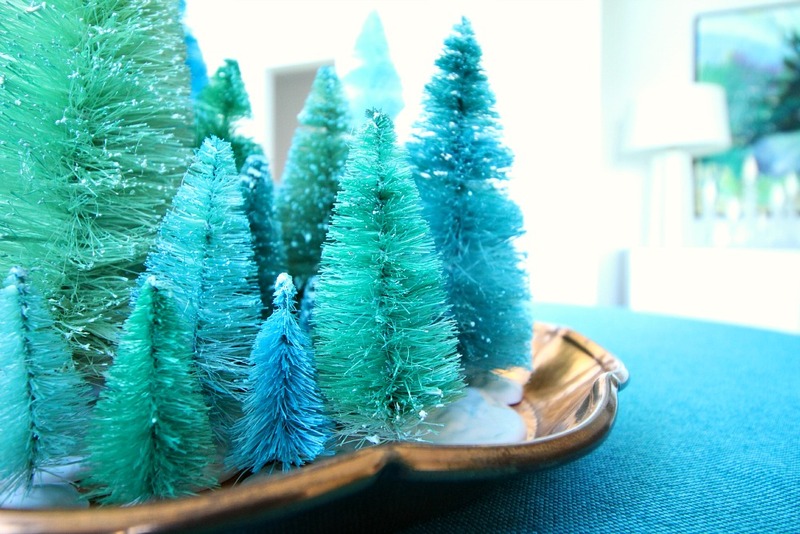 They are cute on a credenza or sideboard, as cake toppers, on a book shelf, dining table centre piece, onside terrariums… Are the Holtz trees nice? I'm thinking I might put them in a window but in a bookshelf could definitely be cute. I think they're probably about the same. The Tim Holtz ones do have a different base though. Just a round bit of wood as opposed to the snowy looking base of your ones. I think the ones you have are definitely more stable, I can't see the TH ones standing up without some sort of adhesive for a long period of time. I guess the pay off for that is they already come ready to colour rather than having to do the bleach step first. A window is a great idea. If you added a bit of glitter after the dye, they would really be magnificent when the sun catches them! That's good to know that the Holtz trees aren't as stable. I prefer the look of the wood base but this plastic one is pretty sturdy. Mostly I liked the variety in sizes, that's why I chose the Lemax ones. Thanks for letting me know! This is totally cute, but strange to me. I love how this looks but had no idea this was a thing. Arem't these plastic? I didn't know plastic could be bleached or dyed. Thanks!! They are Polyresin/PVC (or so says the description). They can definitely be dyed, but I'm not sure how well they would hold up to washing, you know? The dye might be sticking because they're not used. But then, who would wash them? But they don't rub off on my hands or surfaces (I have fondled them quite a bit). So, long story short, yes they can be dyed. After seeing this post, I did my front door and mantle with natural and green trees. I love the look and the cats loved the texture :(. I came down this morning to see all the mantle trees on the floor and half chewed.